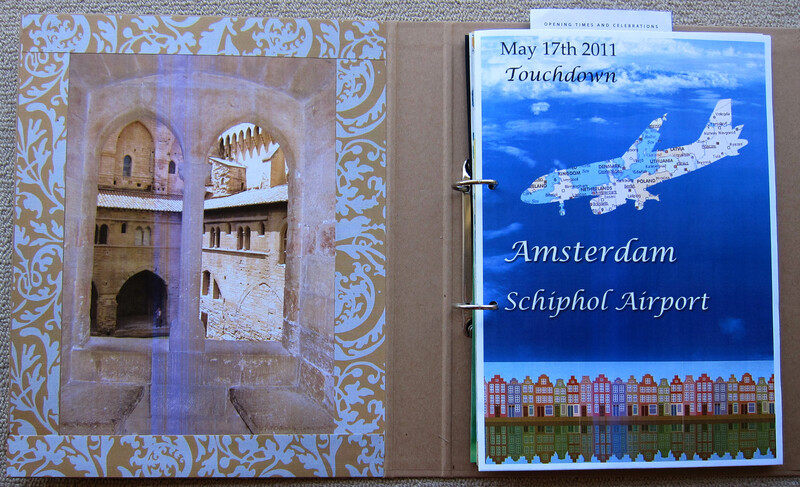 I have been working on my travel journal in between sight seeing, whenever I get a chance. So far I have two main problems….surprisingly .it’s really hard to find places to get photos printed. 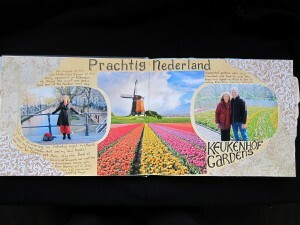 And two, my darling husband wants to be out sightseeing all day everyday just about, so it’s difficult to get long stretches of time needed for art journaling. But as you can see, I have managed it a bit. 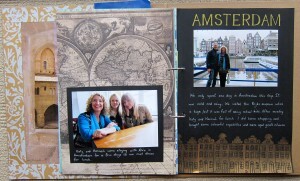 The journal I have is A4 landscape size so when I photograph a double page it’s very long and skinny. I tried taking the pages separately as you can see, but really they are meant to be seen together. 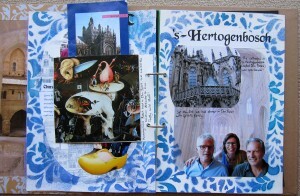 Keeping an art journal definitely enriches the journey for me. It’s fun collecting pamphlets from the Information offices, and looking for pictures and postcards I might want to include. On the left here I have made a pocket from a photograph and put our tickets to the Utrecht museum inside it. The postcard of the old cathedral painting is just attached on one side so you can flip it back and the writing continues underneath it. Nifty huh? For this Amsterdam spread I used a serviette printed with a 16th century Dutch still life painting on the right hand side and I really like the effect. 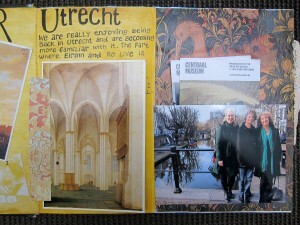 I am enjoying using a combination of postcards, ephemera and photos that we have taken. 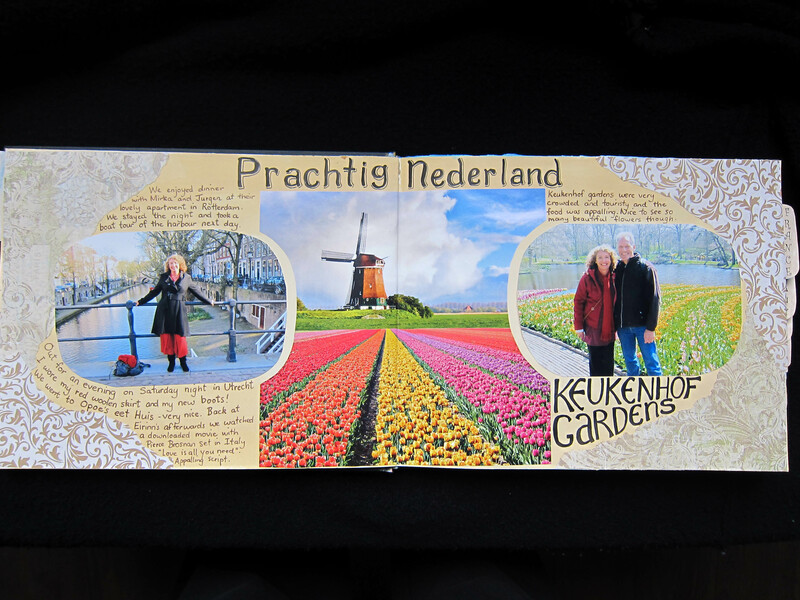 The backgrounds I had already prepared are coming in very handy now, many of them already had paint and some scrap paper borders, so all I had to do was stick in a photo or postcard and write something. However I know there are a lot of totally blank pages coming up late in the journal! I have also done a few pages based on our time in Brittany (we are still there) but I will post them tomorrow. It’s been a long day. And if I may whinge about the weather for a minute, it’s still very cold, and also rainy today. I’m sure we will have better weather next week in Tuscany. Love to you all in blogland. 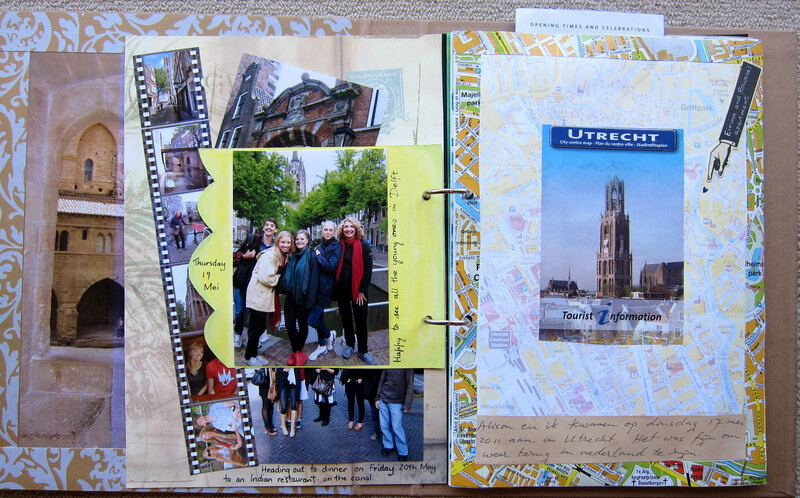 I’ve become interested in travel journaling in the last few weeks and have been looking at LOTS of travel journals, scrapbooks, smashbooks etc on the net. 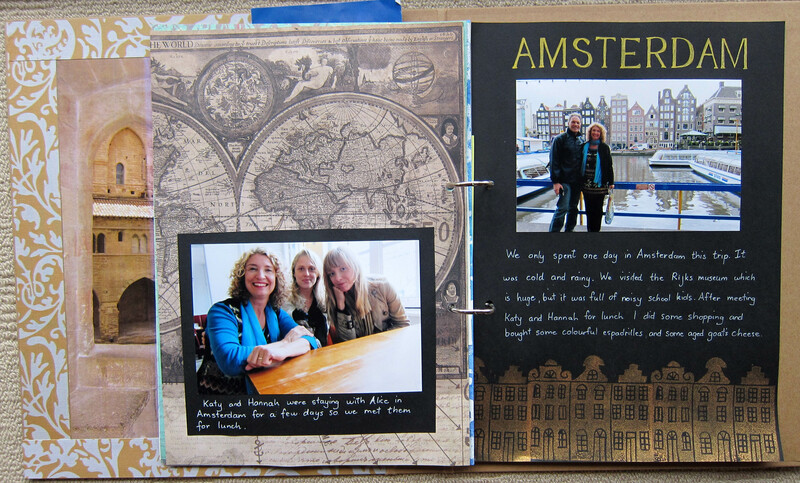 Next year we will be traveling back to Europe (both my offspring are over there) and of course I want to be journaling while I am there. 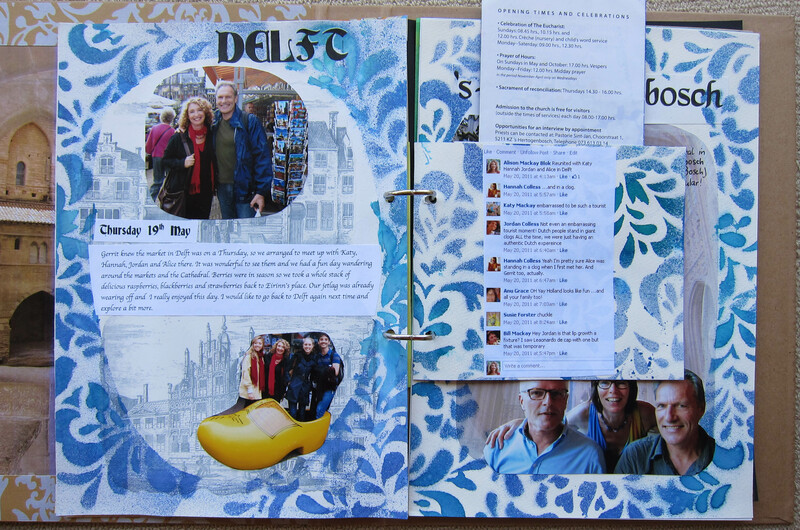 I’m not sure what sort of journal I will be doing, but I thought I would have a go at making a travel journal retrospectively of our trip to Europe last year. So far I’ve only done the first part of it, which was about the 10 days we spent in Holland before we headed off to Switzerland and France. 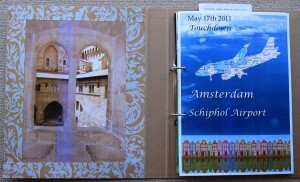 I used a plain 2 ring binder (A4 size). 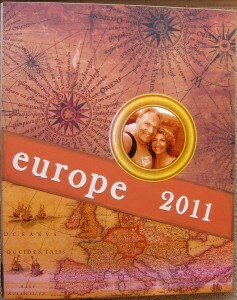 Here is the cover which I covered with a scrapbook paper and an antique map of Europe. Here is the inside cover, on which I put one of my favourite photos taken in the Avignon palace, and surrounded it with a border of a scrapbook paper that I thought looked a bit medieval. The opening page with the airplane I made on photoshop. 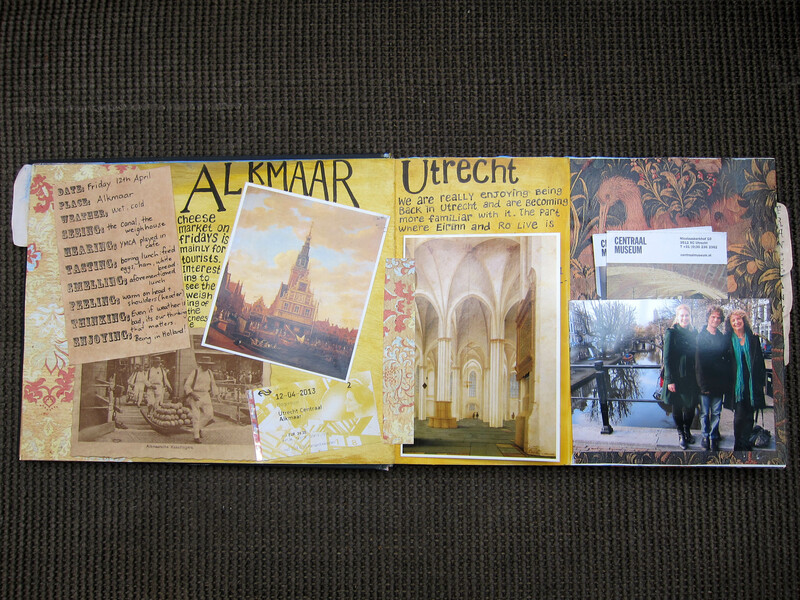 First inside page shows some photos taken in Utrecht (where my son is living) I made a “filmstrip” of a few photos on photoshop. I printed out quite a lot of photos so I had to find ways to fit them in. The small yellow page in the middle has a photo on each side. 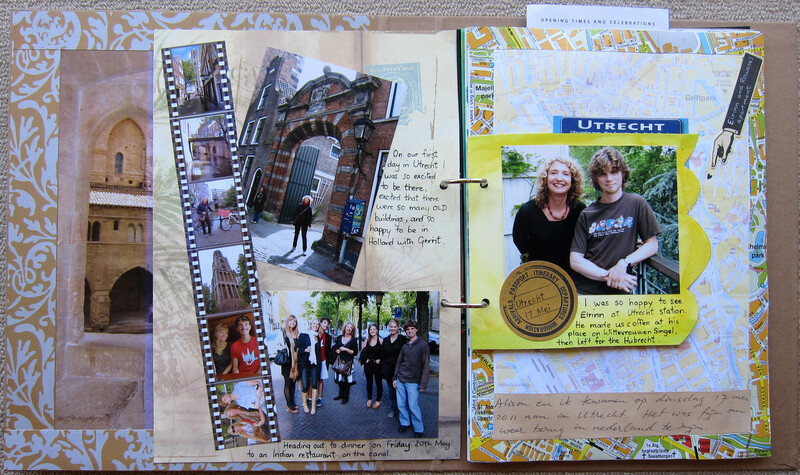 On this next page I scanned a map of Utrecht that we had collected, made it lighter to create the background, then stuck strips of the original map around the edge as a border. I got my husband to write something in Dutch for me also. 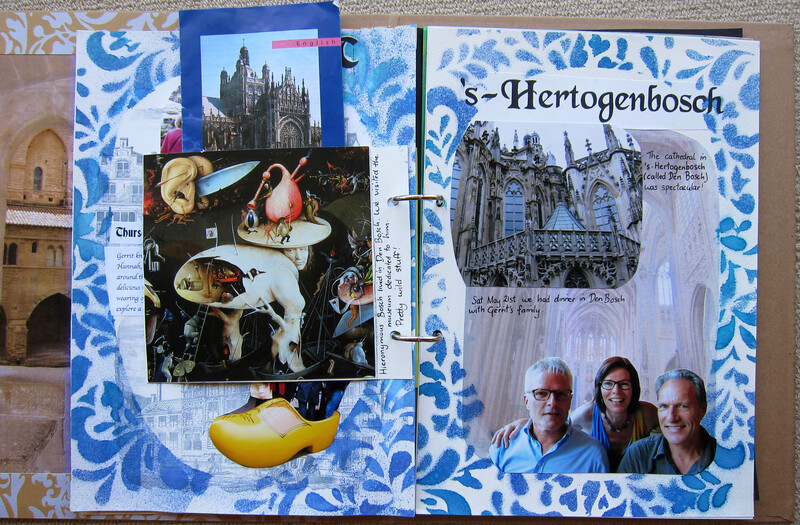 The next 2 pages are a bit more “art journal” and less “scrapbook” like because I used a stencil and some spray ink to create a border (supposedly resembling some Delft blue pottery). First I collaged down some black and white pics of some delft buildings and gessoed over them. When I posted the photo of us in a giant clog on facebook the next day there was a funny little conversation about it, so I took a screen shot of this and included it on an extra flap in the centre. This is also a pocket in which I have put a pamphlet from the cathedral. 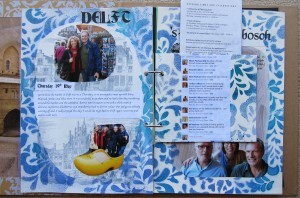 Delft is where my husband went to University many years ago, so it was wonderful for me to see it with him. We spent a couple of days in ‘s-Hertogenbosch, which everyone seems to just call DenBosch. There is an amazing huge cathedral here, very gothic, and we were lucky enough to hear a beautiful choir singing there on the Sunday morning. I also met Gerrit’s sister and brother (pictured at left). The background of this page is a photo I took in the cathedral which I made pale on photoshop. There was also a museum dedicated to Hieronymous Bosch who hailed from this town in the 15th century. The flap/pocket in the middle is made from a postcard from this museum. Here are some more photos from Utrecht, which was our base when we were in Holland. I had a belated Mother’s day lunch there with my two darlings. The page on the right is 3 photos of Utrecht cut in the French scrapbooking style known as Azza, which I discovered on the net. It is supposed to be a kind of tulip shape. The edges of this page are painted with watercolours. I expect I’ll be taking watercolour paints with me next year, but I don’t know whether I’ll be easily able to print out photos while we’re traveling. 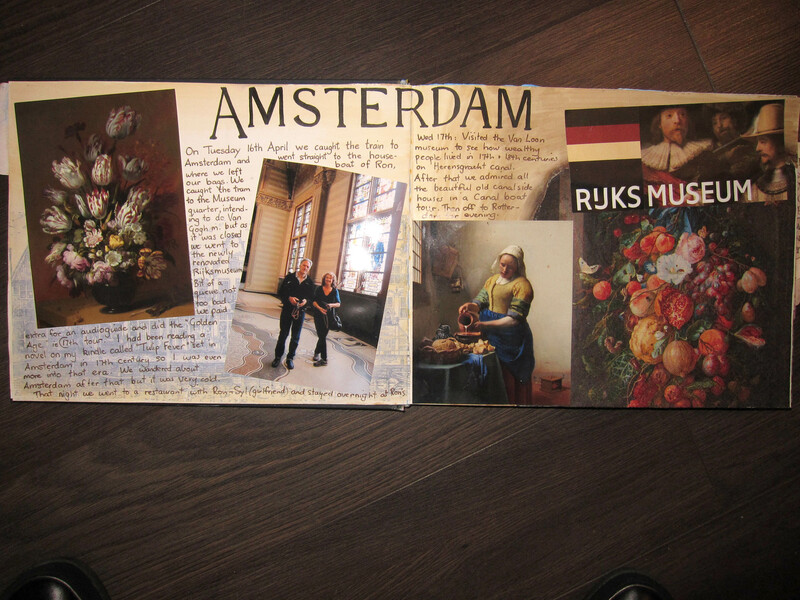 This is the last page that I have done, with a couple of photos in Amsterdam. I made a stamp myself (carved it with ezy carve) of some old Dutch houses (like you see in Amsterdam) and printed it here with a golden coloured ink. I’m rather proud of it. The page on the left is just a scrapbook paper with a photo stuck on it. 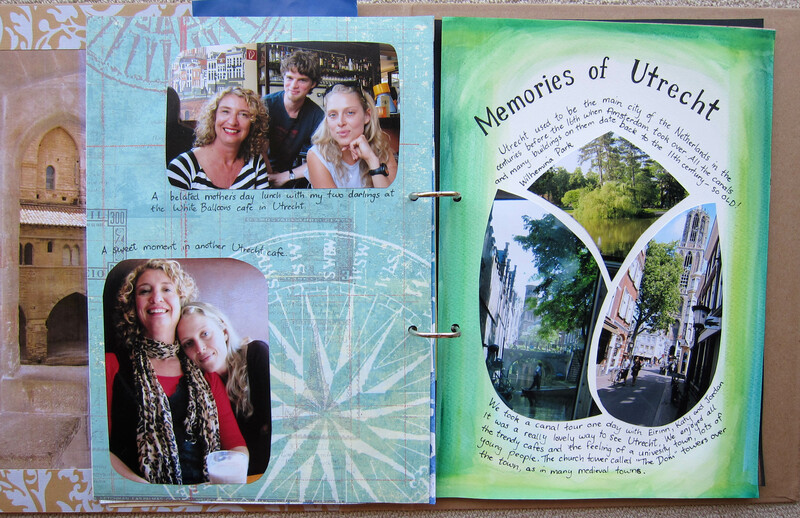 I had fun one day visiting a scrapbook crafty shop in Lismore to buy some travel themed papers for this journal. I guess this travel journal is kind of a cross between a scrapbook and an art journal. It’s been a lot of work so far, and I’m only about one seventh into our trip (which was over 8 weeks long), I’m still learning as I go along, trying out different ways to present the photos, and to write some memories. It has been nice to relive some of those memories while making this journal. I hope that I continue with it. 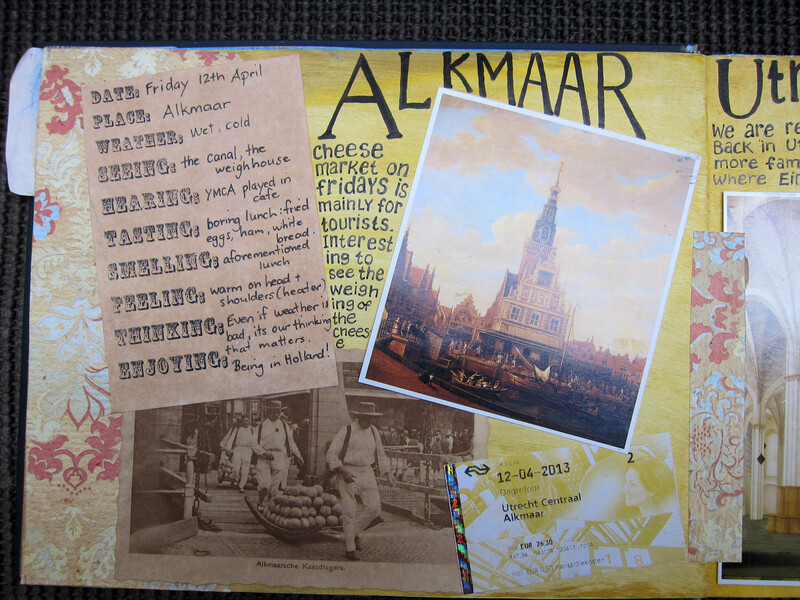 My other art journal is calling to me though, because it is nearly finished, only a few pages left…..and now Zom is back and art journaling classes have resumed, yahoo! Blessings to all of you out there in blogland.